After the party there's the after party and after the after party it's the hotel lobby and after 2-3 days with less than four hours' sleep it's finally time for the MINIMOON. For a more in-depth look at WTF a minimoon is, I refer you with pleasure to this post here. 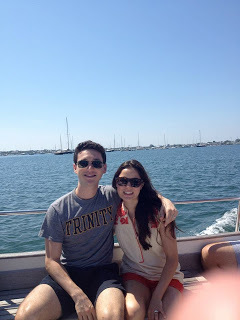 Since we were only going away for three nights, Mike and I left for Nantucket immediately following our post-wedding brunch. This involved some careful packing the Thursday before our wedding (I most certainly had two separate suitcases, one for The Plaza and one for our mmoon), but I am nothing if not uncomfortably titillated by advanced planning, so organizing everything was more of a treat than a hassle. But don't worry, friends, as we experienced some serious hassle the moment we set foot in the airport. Long story short -- because, honestly, air travel horror stories are really only interesting to the person to whom they happened -- Expedia switched our flight from NYC to Nantucket to Tampa to NYC, because ... that's the same thing. Luckily all was sorted out before our plane took off. After a quick layover in Boston, we took the world's smallest plane to the island. One of the other passengers literally sat next to the pilot. As I expected, our luggage didn't make the trek with us and after arguing with Cape Air people for about 30 seconds we both agreed this was the worst use of our time and we'd deal with it in the morning. My first real meal post-wedding diet (I inhaled a bit of french toast at our brunch but I couldn't even enjoy it I was shoveling it down so fast) was at American Seasons, which we both highly recommend if you're on Nantucket. Bread has never tasted so good. After dinner, we walked back to The White Elephant, where we were staying. They absolutely win the Juliet award (it's a thing) for most friendly and accommodating staff on the planet. They took over calling the airline to find our luggage and even brought by tee shirts so we'd have something to wear to bed (after cheekily telling me that maybe this wasn't what I planned to wear on our honeymoon). I can't say enough about how hospitable their staff was. And look at these pillows! The next morning, still in last night's clothes, we walked down to town for breakfast and some new undies. Behold the pancake in all its glory. By far the best bite you will taste on Nantucket are definitely the pancakes at Black Eyed Susan's. They melt a slice of Jarlsberg cheese on top of each cake, making it the most savory/sweet/fluffy/moist breakfast edible in the entire land. 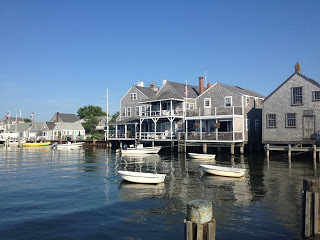 I first had them with my friend Stacey when I went with her family to Nantucket right after college and I have been dreaming of them ever since. It's a wonderful thing when food lives up to your memories. We had blue skies every day. On the boat to eat lunch at the Wauwinet. Mike in a Nantucket-approved outfit.